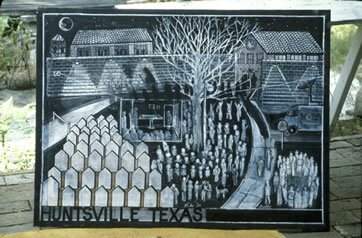 Black/white drawing on cherry wood block before woodcutting for Johnny Garrett is Dead. 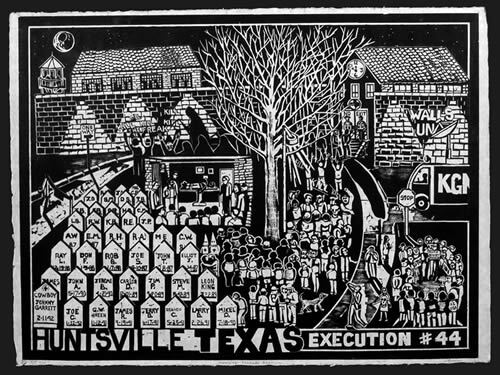 This woodcut depicts the scene outside the Texas Department of Corrections Walls Unit in Huntsville, Texas where Texas executes prisoners. 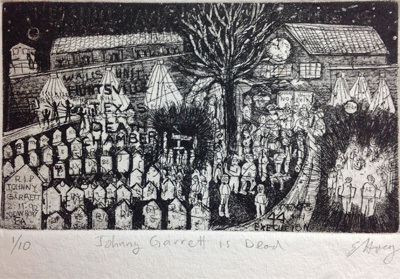 In 1992, I along with about 20 Amnesty International members [link to 52tif] gathered outside the unit to protest the execution of Johnny Garrett. We are the group on the right side of the print. Under the winter tree, about 80 college students [link 51tif] had come to celebrate the execution, to taunt us and to gloat over Johnny's fate. The students were chanting "Kill the freak who killed the nun." So normal looking. Harmless. Those were my first impressions of the Walls Unit of the Texas Department of Corrections in Huntsville. It's backstreet, across the road from an administration block. Trees; grassy verges: a sleepy town at midnight. An altogether unremarkable place. That's probably why I found it so hard to comprehend what I knew was going on inside that building on this cold, blustery night of February 11-12. Premeditated killing by the government is not something I encounter in my country, and this was the first time I had attended the scene of U.S. execution. It still defies imagination. Was a human life really being counted down to extinction inside those brick walls while I stood quietly on a grassy sidewalk, watching a waiting? Johnny Frank Garrett was just 17 years old when he committed the brutal murder that sent him to death row. He was chronically psychotic then, a victim himself of unspeakable brutality throughout his childhood and formative years. Treated like an animal for most of his young life, he responded by behaving in the only way he had ever known--violently. Society should not be surprised; the priorities are all too clear. There is little money available to help abused children but plenty available to punish or kill them when they, in turn, offend by doing violence to others. Now, the poor, damaged, confused life of Johnny Garrett was drawing to its end. What was he thinking, with just ten minutes’ existence left? What goes through a person’s mind at a time such as this? We were some 20 AI members and other opponents of the death penalty gathered together. I like to think we were a dignified group with our simple-hand-written signs, making our witness and our protest. Rain-filled clouds scudded by overhead and we huddled together for warmth, our candles flickering points of light in the gloomy night. A few minutes before midnight, “they” arrived. A rowdy crowd of about 80 college students, mainly white youths in baseball caps. They had come to celebrate the death, to gloat over Johnny’s fate, and to taunt us. They taunted us because we cared, because we care about a man’s broken life and a bigger principle: that governments have no right to use the power we bestow on them to kill us. “ Kill the freak.” “Fry him.” “Remember the nun.” Their ignorance was extensive. Texas kills by lethal injection, not electrocution. They did not know Johnny’s history. And they did not know that the murdered nun’s convent community (together with the Pope and all Texas’ bishops) have appealed vociferously for clemency. They wanted their beloved Sister Tadea Benz to be remembered not by another murder but by forgiveness and mercy. Their pleas for compassion went unheeded. We stood in thoughtful Silence under a STOP sign. The mob roared its approval of Johnny’s murder under a dead tree. They counted down to midnight and the moment of execution. Voyeurs in the night, cheering as the hour struck. Revenge is ugly. At least one death penalty supporter was so appalled at finding himself part of the grotesque display that he crossed the road and silently joined us. AI recruited new members that night. Cameras flashed and snapped as the media came and went among us, seeking the usual superficial stories, bereft of depth or insight. I was asked what I thought of the circus under the dead tree. I said it epitomized so much that’s wrong with death penalty. Executions encourage our most primitive instincts; they set a brutal and dangerous example to society. In short, they bring out the worst in people. The world is sick enough already, I told the reporter. Shouldn’t we be striving for a better way? At 12:10 a.m., the witnesses emerged from the Walls Unit and the crowd dispersed in search of more beer. They were strangely somber. No more chanting. They tried not to meet our eyes as they left. Had the immensity of the act finally touched them? Did they begin to realize that they had been party to a death, as well as partying at a death, and it didn’t feel so good? We lingered a little, hugged, commiserated, and went our separate ways. Stillness descended on the harmless-looking Walls Unit…until the next time. I thought once more of Johnny Garrett’s short, brutal life. His spirit had finally been freed and even now was flying up and away beyond the STOP sign and the dead tree. I hope Johnny found peace at last.